Research Councils UK (RCUK) is the strategic partnership of the UK's seven Research Councils. It invests around £3 billion annually to nurture the highest quality research, as judged by international peer review, providing the UK with a competitive advantage and fostering international collaboration between researchers and businesses in response to issues of public concern, involving public and private enterprises, charitable institutions and the government. With the publication in 2011 of "UK research that will have a profound effect on our future", Research Councils UK selected Seagreens' four-year research project to replace sodium chloride in manufactured foods to feature in the Healthy Lifestyle section of its book: Big Ideas for the Future - please click here to read or download the feature. The Seagreens research was conducted by the Centre for Food Innovation at Sheffield Hallam University between 2007-2010. Certain aspects of this important project have led to further ongoing studies in the public interest. In the past two years Seagreens' contribution to this work has been co-ordinated by the newly formed Seaweed Health Foundation. In April 2012 Dr Craig Rose, Executive Director of the Seaweed Health Foundation, presented the research findings to an RCUK conference in the City of London. 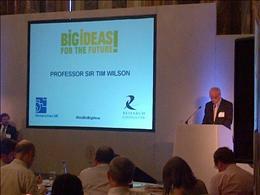 The conference was introduced by Professor Sir Tim Wilson, as a Trustee of the Council for Industry and Higher Education (CIHE). 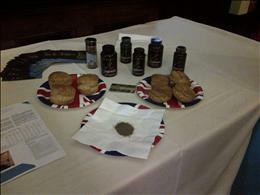 Coinciding as the conference did with the Her Majesty Queen Elizabeth II's Diamond Jubilee celebrations during the first weekend of June, salt-free 'Right Royal Scones' containing Seagreens human food quality seaweed ingredient were very proudly prepared and on display - and much appreciated by those lucky enough to try them!